The Soul Food Bistro is a fresh and exciting place to be. It has a contemporary flair, but encompasses a welcoming atmosphere. Whatever the occasion, The Soul Food Bistro accomodates with the perfect ambience, boasting rich, warm colors and modern highlights. It is a place where eager diners have the option of enjoying a hearty lunch or a convenient and fulfilling evening meal with great company. 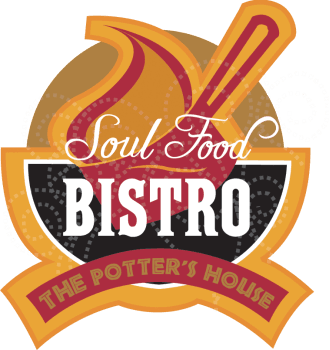 The Soul Food Bistro was opened by The Potter’s House Christian Fellowship of Jacksonville, FL in 1998. The original name was The Potter’s House Cafe where the menu, size, and scale of the facility was significantly different. The original space was only around 600 sq.ft., but the place was packed and the word traveled fast about the extraordinary food.